Veteran bluegrass act the Devil Makes Three headed to New York City in support of latest album I’m A Stranger Here. Paste captured the trio of Pete Bernhard, Lucia Turino, and Cooper McBean behind the scenes of their triumphant headlining show at Terminal 5, including an intimate warm-up session before hitting the stage. Over the course of an hour and a half, the band alternated between somber and celebratory, blending Southern Gothic imagery with their California roots in Santa Cruz. 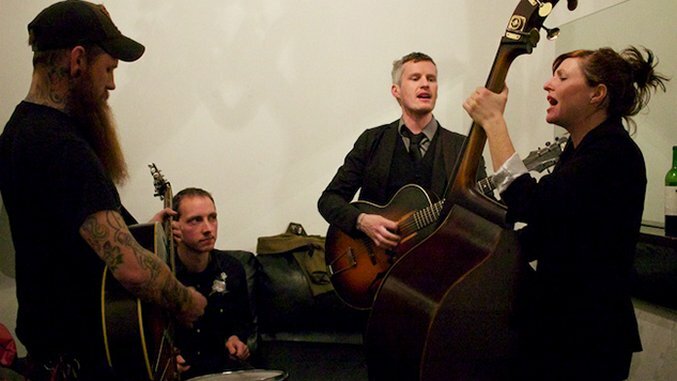 With more than a decade together under their belts, the Devil Makes Three know a thing or two about putting on a show, delivered with an earnest wit and the moxie of their favorite soda.